I’ve long been fascinated by Scottish things. I asked for and received bagpipes for Christmas as a child. As a teenager, my parents gave me a book entitled The Hammer of God by James H. Hunter, about a man who assumes another identity to protect people during the Scottish Reformation. This alter ego also fascinated me, for I’ve long been a fan of the Lone Ranger, Zorro, the Scarecrow of Romney Marsh, and the Shadow. When I first wrote the opening scene in The Scottish Thistle, it seemed only natural that I incorporate a masked figure into a story set in Scotland. Lightning flashed; in the instant it illuminated mountain and glen, Thistle glimpsed a lone rider spurring his mount along the rough Highland track bordered by tall firs. The thing was while I knew where Scotland was and that it had a Lowlands and a Highlands, I only knew two other facts about the country: the men wore kilts and the people speak with a brogue. Not exactly what a writer needs to write a full-length novel. Begin trained as a librarian, I knew how to research to find more information. 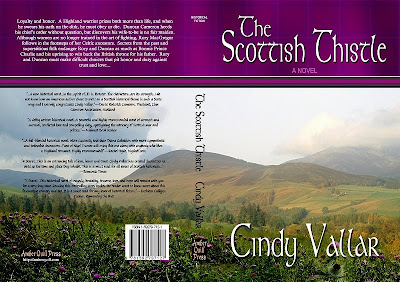 I already knew I was going to write historical fiction, but not knowing anything about Scottish history, I first had to determine in what time period to set the story. After reading a children’s history on Scotland, I narrowed it down to three alternatives, although I only recall two now: the time of the Covenanters (the Reformation) and the Rising of 1745. The former intrigued me because I had read The Hammer of God, while the latter caught my attention because it involved Bonnie Prince Charlie’s attempt to regain the British throne for the Royal House of Stuart from the Hanoverians who sat on the throne. I asked my husband what he thought would make the better backdrop and he chose the Rising of 1745. I borrowed a book by Sir Iain Moncrieffe entitled The Highland Clans, which was filled with fascinating tidbits. One was the fact that a man named Sir Donald Cameron of Lochiel was chief of a small, but influential clan at the time. His family had long supported the Stuarts, so when Prince Charles asked for volunteers, Lochiel brought out the clan to fight for the Stuarts. What fascinated me about this was historians felt that had Lochiel not used his influence and supported the Jacobites, the Rising of 1745 would have ended before it began. This knowledge inspired me to write about the Camerons and what happened to them during the rebellion. Now that I had the clan for Duncan, my hero, I also needed a clan for my heroine. As I continued to read Moncrieffe’s book, I learned about how the Stuart kings put the MacGregors to the horn, outlawing them. They weren’t permitted to use the name MacGregor. A murderer could escape punishment if he brought in the head of a MacGregor as penance, and that was just one example of the persecutions this clan suffered. Yet unlike other clans that disappeared, the MacGregors thrived and survived. That knowledge inspired me to choose Clan Gregor as the family of my heroine, Rory. 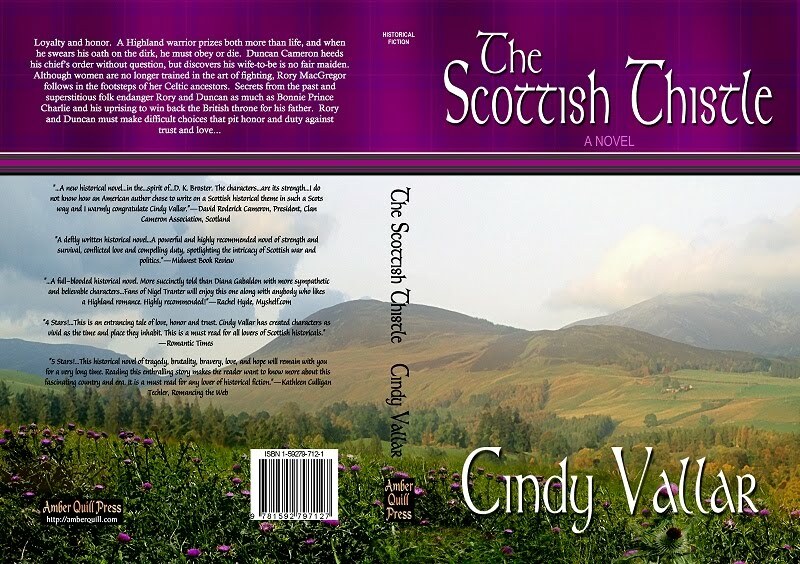 So while sitting in a boring staff meeting one day, I wrote the opening scene of The Scottish Thistle, and the information I gleaned during my research inspired me to tell the story of the Camerons and MacGregors during the Rising of 1745. You can purchase The Scottish Thistlevia the author’s website.